5 Reasons To Have Exterior Lighting On Your Home! As lighting fixtures have become more decorative the market has provided designers and decorators artistic license. From nostalgic reproductions to architecturally inspired designs, there are models of lighting fixtures just waiting to define a period style and to enhance the exterior. Lighting is an element of architectural design and should be used to enhance the exterior statement of your home. Exterior lighting is an important choice. Not only does it affect safety and security, but it also has an impact on curb appeal and resale value also. The entry is the first area encountered when arriving, and the last when departing. The correct lighting makes it as beautiful as the rest of your home. Let your entry set the mood for what's to be found within your home. Use lighting to accent your porch, visually expand the entry space, lead the eye with pathway lights or markers, and make your guests welcome. Depending upon how fixtures are angled, diffused, and positioned your light can glow, create shadows, reflect from surfaces, pinpoint architectural borders- They can be mystical and romantic when used in path lighting, cove lighting, and of course be informative when used with signage. A well balanced lighting scheme is made up of three key lighting types- a flattering general light, task lighting that performs a functional purpose, and feature lighting that can put displayed objects in the spot light. You can move beyond the practical by using lighting fixtures imaginatively. Create dynamic visual statements, enhanced mood and atmosphere, alter color and emphasize the textures of walls steps and lanscaping. When balanced with shadow, lighting adds subtle excitement, tranquility and mystery. A powerful elements of design, lighting fixtures can instill the simplest space with richness and depth. Lighting fixtures can be used to obscure and highlight, create shadow and color. Lighting fixtures can transform the home in the same way that lighting in theater transforms the stage. I recently read about powerful LED neon lighting. This flexible product looks like neon and can be used in anywhere on the exterior. Its not necessary to match fixtures. To create a sophisticated look you can combine more than one type of fixture. For more interest select your fixtures in different, but coordinated finishes. The exterior environment of your home is a demanding location. Rain, snow, cold, sunlight is hard on exterior lighting fixtures. Always look for quality outdoor lighting manufacturers. Their use of superior materials and finish techniques ensure maximum life and maintain the appearance. Cheap fixtures offered by some chain stores may seem tempting but these fixture usually fail prematurely, weather badly and look bad. Look for fixtures with finishes such as polished brass, verdigris patina, raw copper and bronze. Copper will turn verdigris with time. Wall mounting fixtures provide shafts of light up and down or both. 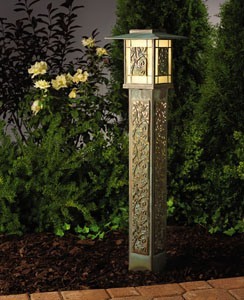 There are fixtures suitable for walls, posts, trellis and either side of entrances. Create quality lighting with the fixtures designed to be unobtrusive. With the wide range of fixture available lighting effects such as highlighting, spotlighting, backlighting, and moonlighting can be achieved. The spike lights, lights set on spikes that can be positioned to light features, trees, ornamental objects, can light to the font of any object or light from the back creating dramatic lighting effects. Exterior lighting must be practical as well as attractive. The blend of wattage requirements with design creates a functional lighting plan. Too little illumination can lead to safety hazards by visitors and may well invite unwelcome visits by burglars. Too much wattage and incorrect illumination can leave a home with a garish glare unpleasing to the eye.